When my wife Laura and I started brainstorming our new shop, we decided we wanted a really different kind of aftercare sheet. I was really inspired by Infinite Body Piercing's beautifully designed aftercare sheets, but I felt like I had different information that I wanted to get across. Inspiration hit me one day: one of my favorite things about getting a new piece of electronics is pouring through the instruction manual, looking at all the cool features I just invested in. Where was that for Gamma Piercing's clients? They are spending good money on the most beautiful body jewelry available. Doesn't a stunning piece of jewelry from Anatometal, BVLA or Neometal deserve the same kind of user's Manual as a pair of headphones or a new camera? Thus was born the Gamma Piercing Aftercare and Jewelry Manual. Our aftercare is presented as simply as possible, with instructions on cleaning covered in a simple to follow paragraph. In addition, jewelry design, installation, maintenance, and precautions are covered explicitly. Gamma Piercing's clients leave the shop knowing how their jewelry works, what size it is, and what they need to do to protect their investment. The whole manual was written by me and beautifully designed by Dannielle Greenwood. 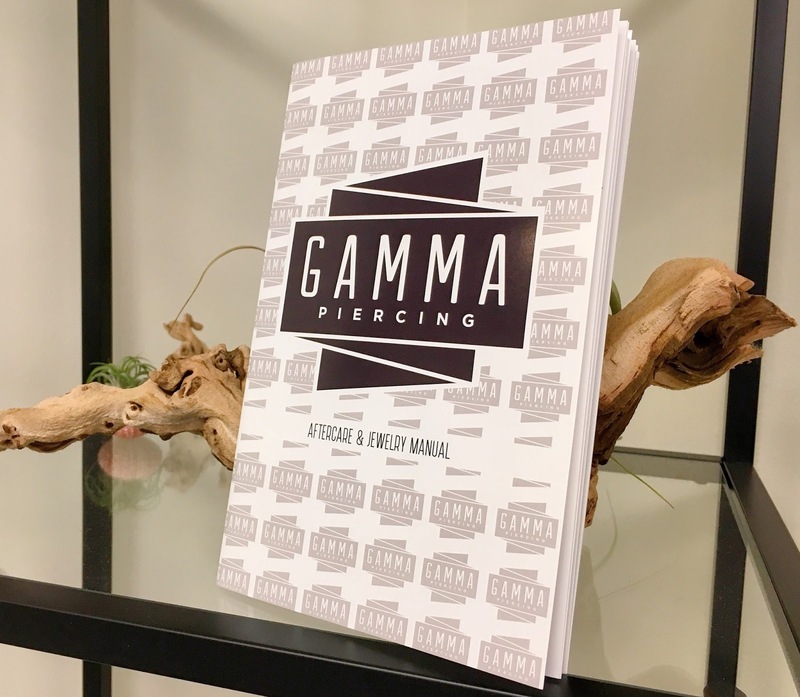 Gamma Piercing's First Blog Entry: What is a Disposable Piercing Studio? Just last month my wife and I opened the doors on our new shop, Gamma Piercing, in Ann Arbor Michigan. It has been a wonderful experience. I can’t say enough about the people of Ann Arbor. Our clients have been truly wonderful, and every day we feel lucky to offer piercing services in Laura’s hometown. In this blog, I’m writing primarily to people in the industry. Apprentices, piercers, tattoo artists, business owners, etc. Very rarely in the course of this blog do I try to speak to my clients directly. One of the things I’ve been looking forward to is writing to them through my new shop’s website. The tragus was the very first piercing I ever watched. I know I’m dating myself a bit here... but imagine this. It’s Halloween day, 1996. I am a college freshman and I’m attending the University of Connecticut. My girlfriend at the time decides that she wants to get her tragus pierced, and since it’s her 18th birthday, we decide that getting the piercing done will be her birthday present. She was attending Providence College, so I drove from Connecticut, picked her up, and we went to the skate shop/piercing shop across town from her dorm to get the piercing done. The fact of the matter is, I knew almost nothing about body piercing. I knew the piercer shouldn’t use a gun, and he or she should wear gloves. After that, it was a stupefying mystery. When I saw the tragus piercing performed, it was like watching someone perform brain surgery. Actually, that isn’t quite accurate. It was more like alchemy. Something far more magical than technical. The skin gets clamped? Why is the needle curved? Wait a second, that ring gets bent before it gets put in?!? It was like lightning struck me. I was possessed by an overpowering need to learn how to do body piercing. After that day, I became voracious in my appetite for information about piercing. Looking back on 20 years of learning, I am still thankful for that very first piercing experience. Not surprisingly, the tragus has always had a deeply special place in my heart since that day. I also find the piercing to be tremendously challenging. There is a lot that goes into making sure the tragus piercing goes well. If the angle is off, the skin is shifted, or the jewelry choice is ever-so-slightly wrong: failure. Those of you who have read my blog in the past will not be shocked when I say I have a lot of opinions on how to make these piercings work well… but the first step is understanding the anatomy. The tragus isn’t really like any of the other parts of the ear, when you think about it. Grab your tragus for a second, and roll it between your thumb and your index finger. Notice how the skin shifts over the cartilage underneath it? Now try that same thing on the conch, or any of the other parts of your ear that are easy to pinch. Nothing quite feels like the tragus. The tragus even feels a little “fatty”. This complicates our job as piercers. This is the hardest challenge for most piercers to contend with; the skin and connective tissue that cover ear cartilage are flexible, and can be shifted out of place during the piercing process. That may seem obvious. If you distort the skin during the piercing process, you permanently pin the skin out of place. A piercing performed with this error seldom, if ever, heals. I posit that tragus piercings that have recurring piercing bumps that aren’t obviously caused by angle or jewelry issues are likely suffering from subtle tissue distortion during the piercing procedure. Probably the two most common piercings to develop piercing bumps are the nostril and the tragus. Piercers tend to look at the client to place the blame on them. (Did they touch it? Did they get makeup in it?) Much like the nostril, I choose to look critically at the job we are doing and try to see if there are reasons us piercers may be the cause of these bumps. Again, pinning the skin out of place causes chronic irritation. That chronic irritation results in piercing bumps. More on this when we get into techniques, but keep this at the forefront of your mind. My wife has a saying: tragus anatomy is like a camel, you get one bump or two. The discussion that you should have with any client who has “two hump” anatomy is this: “Do you think you’ll ever want a second piercing? Which mark looks like the middle to you”? This is a big deal. With anatomy like this, the “center” of the tragus can look vastly different from person to person. The problem is this: to some people, the center of the tragus is a math problem. Wherever the top of the tragus begins and the bottom ends, divide that space in two and that is the center. Often, this placement is directly in the indent of the two “humps” of the tragus. This means there is less cartilage on either side of the piercing, and it can also look a little awkward. It also means adding a second piercing is impossible. The alternative, and my preferred placement, is to place the piercing in the center of the bottom “hump”. This way, there is enough tissue to locate the piercing in, and it allows for the client to add additional piercings in the future. Piercers sometimes struggle with depth on tragus piercings: too deep and the piercing rests on the cheek, too shallow it can migrate out. The tragus really benefits from a strict application of the Perpendicular Principle of piercing, which you can read more about on my blog. The tragus must be performed as perpendicular to the anatomy as possible, which presents some challenges because tragus anatomy is seldom flat. 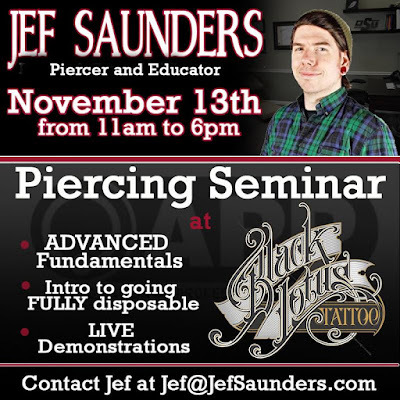 What piercers need to do is focus on making a perpendicular piercing, even if it takes extra time to make that happen. While some piercers have an innate ability to achieve perpendicular, I believe most piercers should spend extra time diligently marking the anatomy. I like to really mark up a tragus. My first mark is a vertical line where the tragus folds. This gives me a reference for where the tragus turns into the cheek. Piercing any closer to this line than 1/8th of an inch (~3 mm) is probably too close. The next mark I like to make is a vertical line on the “edge” of the tragus. What I mean by “edge” is basically marking the transition of the front of the tragus to the back of the tragus. I find it exceptionally helpful to make this mark, as it simplifies the next marks for me. Again, piercing closer than 1/8th inch to this line is a bad idea, as you will almost certainly pierce just skin, not the cartilage you are aiming for. Typically, with these two lines as a reference, you can make a dot in the center of them. This dot should be at the center of the tragus on “one bump” anatomy, but as previously discussed, you must consult with your client on “two bump” anatomy. At this point, I draw a horizontal line perpendicular to the edge mark I made, pointing at the dot. Now I duplicate that line on the back side of the tragus and mark a dot exactly opposite the dot on the front. This should yield a perfectly centered, perpendicular piercing. Remember, though, perpendicular piercings will heal far better than angled piercings. Which means you really need to inspect tragus anatomy. It can be really weird! Especially when performing double piercings, do not expect the barbells to be strictly parallel with one another. Perpendicular is far more important! I am usually a big defender of rings. If you want to know more about my thoughts on rings, check out my blog entry here. That having been said, the tragus is a place for straight jewelry exclusively, at least while the piercing is healing. I can think of no good reason to start a tragus with a ring. Even variations on rings, such as d-rings, are inferior to straight jewelry. Straight jewelry presents us with some options, though. We can use large disk flatbacks, small disk flatback, and barbells. Over the years, I have developed a gentle preference for barbells in tragus piercings. Why? I find that the back side of a tragus is very challenging for the client to clean. When they have a flatback style jewelry, the amount of crust that develops and clings to the disk is significant. Barbells are simply easier to clean. Of course, barbells are atypical for tragus piercings, and I understand why. Our clients love having an unobstructed path to their ear canal (for ear buds and the like), so the less in the way, the better. Your mileage may vary, but if you haven’t tried a barbell I’d encourage you to give it a whirl. I have a preference for 16g barbells in the tragus, though I will use both 14 gauge and 18 gauge if circumstances require. In general, the stability of 16 gauge is effective, without being too thick for what can be very small tissue. Most tragus tissue measures out to about ¼ inch (6.35mm), so for initial piercing, I find myself typically using 5/16ths inch (8mm) barbells. This allows for the client to clean, and for a small amount of swelling. Be cautious when choosing jewelry length for a tragus. While most tragus piercings fit this description, there are some clients who have very bulbous, thick, round anatomy. These are challenging to pierce and can require much longer jewelry. Jewelry ends have gotten amazing, haven’t they? Jewelry manufacturers keep on outdoing themselves, and I’m proud to say piercers are slowly but surely becoming expert jewelry stylists. Have you seen Miro Hernandez’s portfolio?? It’s crazy what people are able to deliver. I’ve seen this new plethora of jewelry options be the undoing of piercers before… and I now beg that you bear with a small digression for me. Often, I see jewelry that is too big or just inappropriate for a tragus used as the initial jewelry. I think our colleagues have developed a knee-jerk reaction to this: “You used inappropriate jewelry because you wanted to make a big sale”. I invite everyone to explore two alternative possibilities. First, Hanlon’s Razor: Never attribute to malice what could also be attributed to incompetence. I say that with no judgment. Often piercers use the “wrong” jewelry, not because they are greedy mouth breathing scoundrels, but because they are inexperienced in the use of this amazing NEW jewelry. Let’s cut these folks a break. The other option is that they have made the mistake of trying to please their client, even if it wasn't the best option for the healing of the piercing. I invite the piercer who has never done this to cast the first stone. How do we avoid this mistake? I think it is a skill we develop over time, but there is a simple formula. Remember how we marked? That line near the fold, and the other line marking the edge of the tragus, and then the dot in the middle? Okay, so the distance from the fold line to the edge line is the largest piece of jewelry we can place in the piercing. For the initial piercing, we should probably aim for at least 1-millimeter shorter. Problem solved. While I know reducing tool use is popular amongst piercers, the tragus might be a great place to back up and rediscover the joys of working with tools. Remember, one of the hardest things to do while piercing a tragus is to avoid the skin rolling over the cartilage during the piercing process, resulting in a piercing that won’t heal. By using a clamp, the piercer effectively pins the skin and connective tissue into place against the cartilage. The other thing the clamp simplifies is piercing perpendicular to the tissue. If your initial marks are good, and the clamp is aligned on the anatomy so that the dots are aligned perfectly, it should be very easy to execute a precise piercing. It’s important when using this technique to try to hold the clamp in such a way that the normal angle of the tragus isn’t distorted. I’ve seen people delicately place the camp in place, and then wrench the tissue out of shape to perform the piercing. This doesn’t yield the result you want. I used an angled receiver tube on the tragus for the first 12 years of my piercing career, and I’ve come to the conclusion that it might be the worst way to do a tragus. Certainly, with skilled hands it can be done, but there are a few things an angled receiver tube just isn’t great at. First, depending on the shape of the tragus, you may not be able to get really firm pressure on the back of the tissue. This means that you can distort the tissue out of place when performing the piercing, causing the healing to be almost impossible. Next, some piercers will use the flat end of the receiver tube and press the tragus into a place where they can pierce straight through into the tube. This is a genuinely bad idea. The tissue shifts dramatically over the cartilage that has been shifted into place. When the piercing occurs, it permanently holds the skin in this distorted manner. I’ve even seen tragus piercings that developed a new fold on the skin from how they were pierced, with the skin pinned away from where it naturally should sit. Finally, the angle of an angled receiver tube is seldom used by piercers appropriately. The idea for the receiver tube is to go straight through, and this means the needle point will come in contact with the tube in most cases. Unfortunately, piercers will try to hit the hollow portion of the tube and will skew the angle of their piercing. Again, I used this technique for years with quite a bit of success, but in hindsight, I was making this piercing much harder than it needed to be. Pictured above are top views of two tragus piercings. On the left, the tissue has been pierced as perpendicular as possible. On the right, you see the shallow exit (and unintentional tilt toward the cheek). Receiver tubes often cause the issue shown on the right, which we should avoid at all costs. Now that I’ve discussed the way I used to do a tragus, I’m happy to discuss the way I actually do a tragus. The periscope receiver tube is typically made from an 8 gauge needle blank, bent with a 90-degree kink in it. For years I had tried to get jewelry companies to make a version of this for me, but when I saw the needle blank version, I stopped trying. Recently, Glasswear Studios has introduced several new versions of receiver tubes. While I haven’t used them yet, the design is intriguing and seems to fit the description of the periscope. What I like about the periscope is that it is extraordinarily easy to place on the back of the tragus. Since the leverage of the tool puts equal pressure along the whole opening of the tube, very little pressure is necessary to support the skin, and it can be done in its' natural position. When piercing into the periscope, I set the tube and make sure skin isn’t shifting over the cartilage underneath. I then carefully set the needle on the front, again monitoring for shifting, and then I can pierce quickly, easily, with perpendicular angles far easier to achieve than with an angled tube. Piercing without using anything to support the skin besides our fingers makes a lot of sense on certain parts of the body. You do get superior tactile information about what kind of tissue you are piercing, so on a tragus that makes a lot of sense. If you can feel the skin shift over the cartilage, you know to regroup. I have several friends who do a variety of different freehand tragus piercings. The most popular version amongst them tends to be the “candy cane”, bending the needle with a very tight 180 curve. This allows them to pull the needle toward them, usually in a swift motion, piercing perpendicular to the tissue. I wear size medium gloves. I don’t have especially large fingers, but they aren’t so small either. I have made lots of attempts at completely freehand tragus piercings, with decent results. For me, my fingers being so close to my piercing exit makes me uncomfortable. I consider this a good way to do the piercing, but not for me (for the time being… I may change my mind with more practice). My strong suggestion: if you are going to attempt freehand tragus piercing, practice on foam board before you try it on a person. Developing the technique and being accurate with it is much easier if you get a few hundred pokes at an inanimate object first. Curved needles really are the way to go on all of the piercing styles discussed in this blog. I strongly recommend practicing custom bending needles before you attempt to use them on a paying client. I love the extra control I have when piercing these spots with a curved needle. I bend my needle over my thumb, which gives me a perfectly thumb-shaped needle. Piercers like Ruben Lew will bend needle a variety of different ways to give themselves options for performing the piercing. Pre-bent needles are also available. For years and years, I didn’t use any threadless jewelry. I just screwed on ends. I typically used a tool to do this, no big deal. As I went from a facility that reprocessed tools to a disposable only studio, I found that I really hated needing a tool for every tragus. Threadless jewelry really fixed that problem. Of course, there’s a learning curve on threadless as well, but wow does it make tragus insertions easy. If you have never used a disposable insertion rig, consider trying one! For 16 gauge jewelry, I pierce with a 15 gauge needle. To make the rig is easy: you’ll need 16 gauge needle blanks and 22 gauge needle blanks (also called “transfer pins”). You’ll use 26g transfer pin for “universal” threadless ends. The transfer pins are available from Industrial Strength, LLC. Simply bend a 22 gauge needle blank just enough so that it gives resistance when being pushed through a 16g needle blank. The end result should look like a pin taper. Tragus piercings are one of those piercings that we do so often we can forget how much goes into them to make them successful. Think about it. You’ve got jewelry length. Threaded/threadless end size issues. What should the back of the barbell look like? You’ve got the tremendous challenge of piercing perpendicular on round, often bulbous tissue. You need to do this all while piercing tissue that loves to shift upon itself. I never even bothered to mention the challenges of placing a sterile drape on this part of the ear, or those hairs that like to sneak off the sideburn area onto your prepped skin. There is obviously a lot going on for the piercer to process. But wow, tragus piercings are great. Remember when I felt like the piercing was more magic than science? While I may have gotten very technical from that point on, I still feel that way. Piercing is magical. As someone who looks at a lot of piercings, tragus piercings are one of those that really separate competent piercers from spectacular piercers. While I have high hopes for the quality of my blog, my biggest wish for this one is that the piercers who read this entry go into work tomorrow with a renewed enthusiasm for this beautiful, challenging, fun piercing. 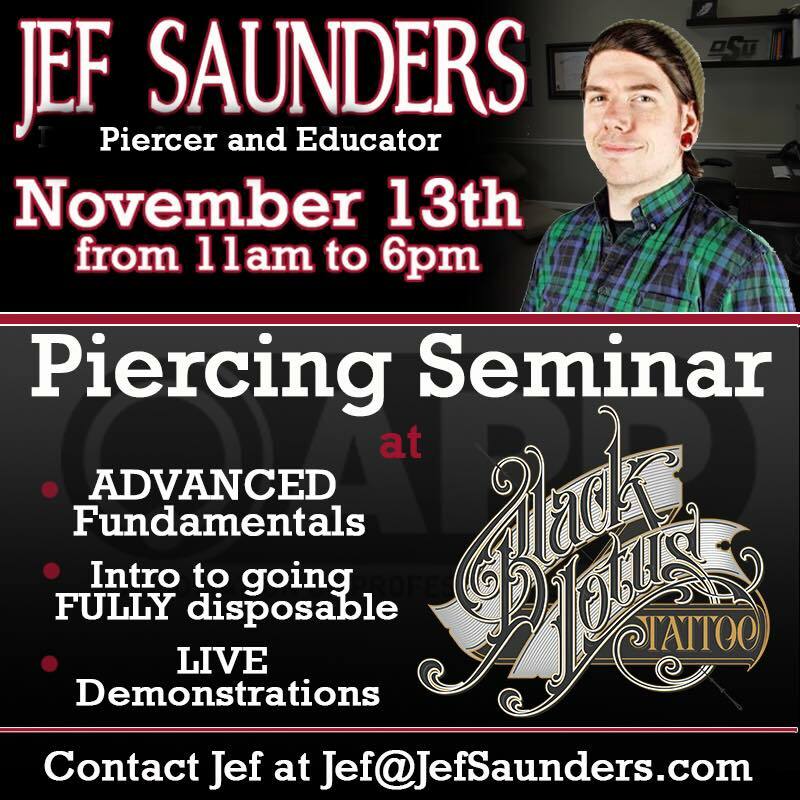 Tragus Piercing: Advanced Fundamentals by Jef Saunders is licensed under a Creative Commons Attribution-NonCommercial-ShareAlike 4.0 International License. Recently, the internet has been all abuzz with a new idea. That idea being that daith piercings can somehow cure migraines. I happen to LOVE daith piercings. I write about them maybe way more than I should. Like here. And here. And, well now here. I consider myself two degrees of separation from the creator of the piercing: Erik Dakota invented the piercing and apprenticed Ken Coyote. Ken Coyote, in turn, taught me how to pierce daiths. I think they look amazing. I have had my daith pierced several times. And I’m not the kind of piercer who says things like this, but I’m saying it - I’m really good at daith piercings. So with all of that in mind, believe me when I say: there is no solid evidence to point to any piercing as a cure for any medical condition. I’ve got an open mind. Maybe it’s possible. I just don’t think it’s likely. I’ve been a body piercer for a very long time. And I’ve done a lot of daith piercings. Like a lot a lot. If you come into my shop and say, “I want a piercing but I don’t know what”... you are walking out of the shop with a daith piercing. One would assume after all these years of doing daiths, I would have had at least one client say “Y’know I suffered from migraines until recently. I think the piercing fixed me”! But of course that never happened. It never even came up until now. I believe this new phenomenon of client’s claiming to get relief from their piercing is a textbook example confirmation bias and a healthy dose of placebo effect. You get a daith piercing because you heard they cure migraines… and suddenly, voila, no migraines! “Cured”! ...at least until they come right back. Confirmation bias works like this: you are a piercer and you have a hypothesis (this piercing cures migraines) and you cling to evidence that confirms that hypothesis (my clients overwhelmingly tell me this has helped!) and ignore evidence that doesn’t support your hypothesis (I don't speak to all of my clients, these people may very well be experiencing placebo effect, I'm not even sure if they were properly diagnosed by a doctor to begin with). Here’s more about confirmation bias. This is why experiments are built with controls in place. Placebos are used. Information gatherers don’t know who got placebo and who got the medication. Results aren’t sullied by confirmation and experimenter’s bias. This is why studies are so important! Anecdotes thrive on biases, and our biases color our perception of everything we experience. Anecdotes are worthless when it comes to really getting to the truth of the matter. Pretty much every article I find says the same thing “Some people say it works! It hasn’t been studied. Good luck”! This sort of science writing is deplorable. These bloggers and journalists should be ashamed of themselves. Do you suffer from migraines? Not occasional little headaches when you don’t eat enough or you get stressed out. I’m talking real deal “blackout the room, the fan is too loud, I can’t open my eyes except to vomit” migraines. No? You don't get those? Yeah, me neither. But we should count our blessings every day that we don’t because migraines are just awful. They have about as much in common with headaches as stubbing your toe has in common with having your foot cut off. Worse still, migraines are extremely challenging for doctors to treat. I’d venture to say for most people who get migraines, they are merely managed, not cured. Anyone writing about a condition like this needs to understand the tremendous power they wield. And piercers have even more strict ethical standards to follow. People in this kind of pain need to be well protected by rigorous, skeptical journalism and the highest piercing standards. Suggesting anything might help with migraines, especially on the basis of “I dunno maybe, give it a whirl!” is playing with desperate people’s emotions. Have you ever had a health condition that hurt a ton? And doctors helped a little but didn't make it completely go away? What wouldn’t you do to fix that? You don’t throw ideas at a wall and see what sticks with people in a position that vulnerable. If you are pretending to be a journalist, or even just a decent blogger, you base what you write around real evidence and real science. Frankly, the more interesting story is that ideas like this catch on in the first place, and they produce testimonials that convince other vulnerable people. If you are a piercer, it is of the utmost importance that you approach this issue with the highest ethical standards in mind. It is unprincipled to suggest daith piercings can heal migraines in the absence of real, scientific evidence. Please, don't try to make a profit off of the desperation of people with chronic migraines. Spider-Man taught us this in the 1960's! Will we ever learn? Excelsior! I am genuinely hoping that a study will be conducted, and if that study yields positive results I’d be elated. Any piercing science undertaken at all, I’m thrilled by and wholeheartedly support. No matter what the results, we’d have some answers, and not just reckless conjecture. “Jef! I'm a scientist! How can I help”? WOW FICTIONAL SCIENTIST I JUST MADE UP! THANKS FOR READING MY BLOG! coordinate a study on daith piercings. Remember to get the placement correct on these piercings. Remember to pronounce Daith correctly. Daith is pronounced DOTH and not DAYTH. Anyone who says otherwise is wrong. Awww you guys are cute with your lab coats and eye wash stations. “Jef, I'm a fan of piercings and I have migraines, what should I do”? Do you like the way daith piercings look? You should do it! It'll look awesome! But what about my migraines? Jef! I'm a piercer! What do I do? Always remember daith is pronounced DOTH and not DAYTH. Anyone who says otherwise is wrong. Never make claims of treating illness. It's unethical, potentially illegal, but more importantly it's preying on people with a legitimately awful health condition. Don't do that. Piercers- we are going to have clients that swear that nothing has helped their migraines until our amazing work has cured them. And that when people tell us that, it feels GREAT. But I remind you of the huge responsibility you have to people: until this has been studied, any personal experience you and your clients have cannot be trusted. You need to assume these anecdotes are all fool’s gold. If and when a therapeutic effect is confirmed, well, that's a different story and let's talk about it when it happens. Until then, let’s do our absolute best to remember we should look out for people in this vulnerable position the way we'd want to be looked out for in a similar position. When people ask, be honest: this would be an unprecedented first in the history of piercing and medicine. Which means it’s unlikely. Well that’s it folks. Maybe not what you were hoping to hear but honest nonetheless. Whether you are a piercer, a client, a blogger, a journalist, someone who suffers from migraines or just a fan of body piercing - it’s important that we approach this situation with our critical thinking hats on. The big question is this: Do daith piercings have a therapeutic effect or not? That question is, as of yet, unanswered. Until then, no matter who you are, the answer to that question should be: “I don’t know, and no one really knows yet.” Even if that’s not what anyone wants to hear. Daith Piercings: Migraine Miracle Cure? Probably Not. by Jef Saunders is licensed under a Creative Commons Attribution-NonCommercial-NoDerivatives 4.0 International License. Additional thoughts: Keep in mind that if daith piercings can "cure" a disease, and that is accepted without evidence, other health remedies or maladies can be attributed to other piercings without evidence. What happens if Buzzfeed decides navel piercings "cause obesity"? Navel piercings will die. We really don't want that. We can't have it both ways, you see. Body piercing as we know it could very well die by this sword.